Ok, just one more post. I just have all these photos and no time to put them up, so when I get an hour to myself I get ambitious. I think it either means that these crazy knee-high tassled faux suede gladiator sandals (wow!) are the latest trend in London (latest is kind of like last, right?) 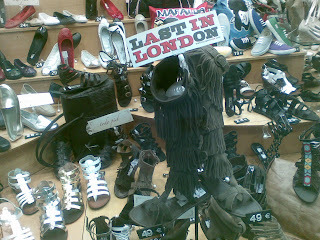 or that they were last seen in London, and are wanted by the shoe police for crimes against humanity.